I corresponded with Josh at Far North Fatbikes in Fairbanks, Alaska about their Fat-bike rental business and asked him to fill us in with some info about their business. Here is some of what we discussed. Look for more from Josh and J.R. in the near future! Far North Fatbikes, the only fatbike rental business in the Interior, is owned & operated by accomplished winter biker Josh Spice, and professional bike mechanic, J.R. Lafleur. Far North Fatbikes’ main interest is introducing the general public to the amazing enjoyment of riding a bike on snow, commonly referred to as winter biking or snow biking. After opening the doors in September 2011, they kicked things off with a weekend camping trip to the Nugget Creek Cabin in Wrangell-St Elias National Park. It was perfect timing for fall colors in the Wrangells and the 14-mile bike ride in to a public use cabin made for a great trip! Check out the photos here. The Far North fleet of Pugsleys is, winterized, and ready for your warm & cold-weather adventures. Starting at 7 pm, every week is a different location. Fairbanks has hundreds of trail miles to be explored. Find out about upcoming fat-bike rides on Facebook! Rides are about 2 hours and all skill levels & experience are welcome. Josh and J.R. love introducing people to winter biking. Already have a fatbike? You’re awesome, so join them with your tricked-out fatty! Every Monday, Wednesday, & Friday at 3 pm ride with the guys who brought fatbikes to Fairbanks! A three day, two night Thanksgiving Break trip, a Christmas ride that could include a White Mountains 100 loop and a pending plan for a mid to late winter ride to the Mondo for what is reported to be the best burgers in Alaska. Josh says the snow is just starting to pick up and that most of the ponds are frozen over. With some additional snow filling in the tussocks and ruts on nearly all the trails should be ridable soon. Check with the locals for current conditions! All rentals include helmet & bike lock. Optional accessories for your ride include frame bags & rear racks, rented at an additional cost. 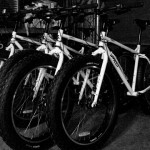 You can get ahold of the guys at farnorthfatbikes@gmail.com or check out the site at http://www.farnorthfatbikes.com.